Asperger's Syndrome is an autism spectrum disorder, one of a distinct group of complex neurodevelopment disorders characterized by social impairment, communication difficulties, and restrictive, repetitive, and stereotyped patterns of behavior. Other autism spectrum disorders include autistic disorder, childhood disintegrative disorder, and pervasive developmental disorder not otherwise specified (usually referred to as PDD-NOS). Autism spectrum disorders are considered neurodevelopmental disorders and are present from infancy or early childhood. Although early diagnosis using standardized screening by age 2 is the goal, many with autism spectrum disorder are not detected until later because of limited social demands and support from parents and caregivers in early life. The severity of communication and behavioral deficits, and the degree of disability, is variable in those affected by autism spectrum disorder. Some individuals with autism spectrum disorder are severely disabled and require very substantial support for basic activities of daily living. Asperger's Syndrome is considered by many to be the mildest form of autism spectrum disorder and is synonymous with the most highly functioning individuals with autism spectrum disorder. Two core features of autism are: a) social and communication deficits and b) fixated interests and repetitive behaviors. The social communication deficits in highly functioning persons with Asperger's Syndrome include lack of the normal back and forth conversation; lack of typical eye contact, body language, and facial expression; and trouble maintaining relationships. Fixated interests and repetitive behaviors include repetitive use of objects or phrases, stereotyped movements, and excessive attachment to routines, objects, or interests. Persons with autism spectrum disorder may also respond to sensory aspects of their environment with unusual indifference or excessive interest. The prevalence of Asperger's Syndrome is not well established. It is often not recognized before age 5 or 6 because language development is normal. Although autism spectrum disorder varies significantly in character and severity, it occurs in all ethnic and socioeconomic groups and affects every age group. Experts estimate that as many as 1 in 88 children age 8 will have an autism spectrum disorder1 No studies have yet been conducted to determine the incidence of Asperger's Syndrome in adult populations, but studies of children with the disorder suggest that their problems with socialization and communication continue into adulthood. Some of these children develop additional psychiatric symptoms and disorders in adolescence and adulthood. Males are four times more likely than girls to have autism spectrum disorder. Studies of children with Asperger's Syndrome suggest that their problems with socialization and communication continue into adulthood. Some of these children develop additional psychiatric symptoms and disorders in adolescence and adulthood. Asperger’s observations, published in German, were not widely known until 1981, when an English doctor named Lorna Wing published a series of case studies of children showing similar symptoms, which she called “Asperger’s” syndrome. Wing’s writings were widely published and popularized. Asperger's Syndrome became a distinct disease and diagnosis in 1992, when it was included in the tenth published edition of the World Health Organization’s diagnostic manual, International Classification of Diseases (ICD-10), and in 1994 it was added to the Diagnostic and Statistical Manual of Mental Disorders (DSM-IV), the American Psychiatric Association’s diagnostic reference book. However, scientific studies have not been able to definitively differentiate Asperger's Syndrome from highly functioning autism. Because autism is defined by a common set of behaviors, changes that were announced in DSM-V (which took effect in mid-2013) represent the various forms under a single diagnostic category, autism spectrum disorder. The cause of autism spectrum disorder, including Asperger's Syndrome, is not known. Current research points to brain abnormalities in Asperger's Syndrome. Using advanced brain imaging techniques, scientists have revealed structural and functional differences in specific regions of the brains of children who have Asperger's Syndrome versus those who do not have the disorder. These differences may be caused by the abnormal migration of embryonic cells during fetal development that affects brain structure and “wiring” in early childhood and then goes on to affect the neural circuits that control thought and behavior. For example, one study found a reduction of brain activity in the frontal lobe of children with Asperger's Syndrome when they were asked to respond to tasks that required them to use their judgment. Another study found differences in activity when children were asked to respond to facial expressions. A different study investigating brain function in adults with Asperger's Syndrome revealed abnormal levels of specific proteins that correlate with obsessive and repetitive behaviors. Scientists have long suspected that there are genetic and environmental components to Asperger's Syndrome and the other autism spectrum disorders because of their tendency to run in families and their high concordance in twins. Additional evidence for the link between inherited genetic mutations and Asperger's Syndrome was observed in the higher incidence of family members who have behavioral symptoms similar to Asperger's Syndrome but in a more limited form, including slight difficulties with social interaction, language, or reading. A specific gene for Asperger's Syndrome, however, has never been identified. Instead, the most recent research indicates that there are most likely a common group of genes whose variations or deletions make an individual vulnerable to developing autism spectrum disorder. This combination of genetic variations or deletions, in combination with yet unidentified environmental insults, probably determines the severity and symptoms for each individual with Asperger's Syndrome. What are the main features of Asperger's syndrome? Limited reciprocal social interaction is a main feature of Asperger's syndrome. These individuals often struggle with the use of nonverbal behavior, the development of peer relationships, sharing their interests and enjoyment, and emotional and social reciprocity. Individuals with Asperger's syndrome often demonstrate encompassing preoccupations, restricted pattern of interests, inflexible adherence to routines, repetitive motor mannerisms (such as hand flapping, rocking), and a preoccupation with parts of objects. Many people with Asperger's syndrome have above average cognitive abilities and are extremely talented in certain areas. The areas of exceptional skills often involve functions of the right hemisphere of the brain, such as skills with numbers, math, computers, and music. Children with Asperger's syndrome generally have difficulty interacting with others and often are awkward in social situations. They generally do not make friends easily. They have difficulty initiating and maintaining conversation. Children with this condition may develop odd, repetitive movements, such as hand wringing or finger twisting. A child with Asperger's syndrome may develop rituals that he or she refuses to alter, such as getting dressed in a specific order. People with Asperger's syndrome may not make eye contact when speaking with someone. They may have trouble using facial expressions and gestures, and understanding body language. They also tend to have problems understanding language in context and are very literal in their use of language. A child with Asperger's syndrome may develop an intense, almost obsessive, interest in a few areas, such as sports schedules, weather, or maps. The movements of children with Asperger's syndrome may seem clumsy or awkward. Many children with Asperger's syndrome are exceptionally talented or skilled in a particular area, such as music or math. All kids have their quirks, and many toddlers show a sign or symptom of Asperger's syndrome at some point. It's natural for small children to be egocentric, and many children show a strong interest in a particular topic, such as dinosaurs or a favorite fictional character. These generally aren't reasons to be alarmed. However, if your elementary schoolchild has frequent problems in school or seems unable to make friends, it's time to talk with your child's doctor. These difficulties have many possible causes, but developmental disorders such as Asperger's syndrome need to be considered. Children who have behaviors that interfere with learning and social development should have a comprehensive evaluation. Asperger's syndrome has only recently been recognized as a unique disorder. For that reason, the exact number of people with the disorder is unknown. While it is more common than autism, estimates for the United States and Canada range from 1 in every 250 children to 1 in every 10,000. It is four times more likely to occur males than in females and usually is first diagnosed in children between the ages of 2 and 6 years. If symptoms are present, the doctor will begin an evaluation by performing a complete medical history and physical and neurological exam. Many individuals with Asprger’s have low muscle tone and dyspraxia, or coordination issues. Although there are no tests for Asperger's syndrome, the doctor may use various tests -- such as X-rays and blood tests -- to determine if there is a physical disorder causing the symptoms. If no physical disorder is found, the child may be referred to a specialist in childhood development disorders, such as a child and adolescent psychiatrist or psychologist, pediatric neurologist, developmental-behavioral pediatrician, or another health professional who is specially trained to diagnose and treat Asperger's syndrome. The doctor bases his or her diagnosis on the child's level of development, and the doctor's observation of the child's speech and behavior, including his or her play and ability to socialize with others. The doctor often seeks input from the child's parents, teachers, and other adults who are familiar with the child's symptoms. Education that is structured to meet the child's unique educational needs. Guanfacine (Intuniv). This medication may be helpful for the problems of hyperactivity and inattention in children with Asperger's syndrome. Side effects may include drowsiness, irritability, headache, constipation and bedwetting. Selective serotonin reuptake inhibitors (SSRIs). Drugs such as fluvoxamine (Luvox) may be used to treat depression or to help control repetitive behaviors. Possible side effects include restlessness and agitation. Naltrexone (Revia). This medication, which is sometimes used to help alcoholics stop drinking, may help reduce some of the repetitive behaviors associated with Asperger's syndrome. However, the use of low-dose naltrexone — in doses as low as two to four mg a day — has been gaining favor recently. But, there's no good evidence that such low doses have any effect on Asperger's syndrome. Asperger's syndrome cannot be prevented or cured. However, early diagnosis and treatment can improve function and quality of life. Do children with Asperger's Syndrome get better? With effective treatment, children with Asperger's Syndrome can learn to overcome their disabilities, but they may still find social situations and personal relationships challenging. Many adults with Asperger's Syndrome work successfully in mainstream jobs, although they may continue to need encouragement and moral support to maintain an independent life. If you have to introduce change, try to do so gradually. There are numerous books and websites dedicated to the disorder. Do some research so that you better understand your child's challenges and the range of services in your school district and state that may help. The signs and symptoms of Asperger's syndrome vary for each child, and young children have a hard time explaining their behaviors and challenges. But, with time and patience, you'll learn which situations and environments may cause problems for your child and which coping strategies work. Keeping a diary and looking for patterns may help. You'll need to make important decisions about your child's education and treatment. Find a team of teachers and therapists who can help evaluate the options in your area and explain the federal regulations regarding children with disabilities. Most children with Asperger's syndrome have no visible sign of disability, so you may need to alert coaches, relatives and other adults to your child's special needs. Otherwise, a well-meaning coach may spend time lecturing your child on "looking at me while I'm talking" — something that can be very difficult for a child with Asperger's syndrome. The tendency to fixate on a particular narrow topic is one of the hallmarks of Asperger's syndrome, and it can be annoying to those who must listen to incessant talk about the topic every day. But a consuming interest can also connect a child with Asperger's syndrome to schoolwork and social activities. In some cases, kids with Asperger's syndrome can even turn their childhood fascination into a career or profession. Lean on family and friends when you can. Ask someone who understands your child's needs to babysit sometimes so that you can get an occasional break. 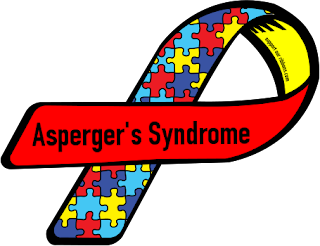 You may also find a support group for parents of children with Asperger's syndrome helpful. Ask your child's doctor if he or she knows of any groups in your area. Or, visit the Online Asperger Syndrome Information and Support website. What Is the Outlook for People With Asperger's Syndrome? Children with Asperger's syndrome are at risk for developing other conditions, such as depression, ADHD, schizophrenia, and obsessive-compulsive disorder. But, there are various treatment options available for these conditions. Because the level of intelligence often is average or higher than average, many people with Asperger's syndrome are able to function very well. They may, however, continue to have problems socializing with others through adulthood.